But there is a right way and a wrong way to approach this task. Get it right and you’ll be enjoying multiple streams of traffic for the foreseeable future. Get it wrong and you will be creating a lot of work for yourself that may not get anywhere near the kind of results you would want. Okay, let’s start with those backlinks. What are they exactly? 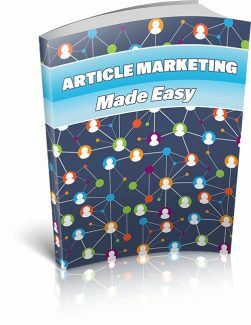 Well each article you write will include a resource box at the end, and every one will include a link to your website. This could be to a particular and more relevant page of your site, or simply to the home page. It depends on what the article is about and where you want your visitor to go to straightaway. But backlinks will get you noticed by the big search engines – the very same search engines that enable you to rank higher in the search results and be seen by more and more people. Now some people have said that you can no longer submit exactly the same article to more than one article directory. If you do, Google will ignore all but one of them and you will have wasted your time in submitting your articles all over the place. This is true in a sense, because those other articles will not get positioned in the search results. But you will also find that if you submit the same article ten times, you will still get ten backlinks to your site. And the more backlinks you have, the more they can help your site ranking. And once you learn how to add rewriting skills into your article marketing strategy, you’ll be appearing all over the place in Google anyway! Read on to find out more about this later on in the report. WHY DO YOU NEED A GREAT RESOURCE BOX? Your resource box is your link to your website. Think of it like a small classified ad. You only have a certain amount of space to get your message across. If it is boring or dull or even just straightforward, you aren’t likely to get much of a response – even if your article is a really good one. It needs to speak to the reader – so reach out and grab them. Think about the resource boxes you have read that have attracted your attention. One of the best things to say in a resource box is that you have a freebie to give them which the reader can get by going to your website. If you are going to do this you should link directly to the page which has more information about it. Don’t make the mistake of linking to the home page and then leaving your reader to figure out where they need to go. That is one sure fire way to lose someone for life. They’ll get annoyed and frustrated and probably wonder why you haven’t been more helpful. Not exactly the best way to convert an interested reader into an eager customer is it? And so on. You get the picture. Draw them in and then give them a link that will lead them to the information they want and need. The one thing you shouldn’t do is to try and sell something from your resource box. Once you have written it, read it through and make sure there are no prices mentioned anywhere. The only thing you can mention in terms of what something might cost is one word – FREE. Everyone likes getting something for nothing, and since a free report or eBook is easy to make available with no actual cost to you, it’s a no brainer to include one of these as an offer in your resource box.